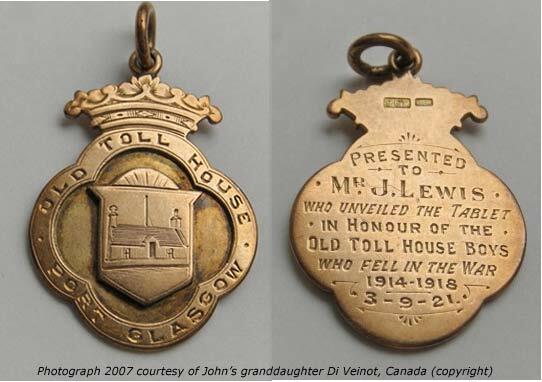 My father, JOHN LEWIS was born and brought up in Glasgow. 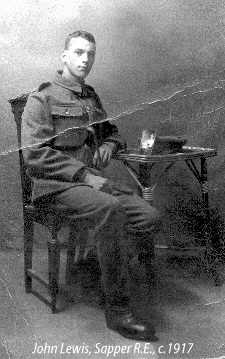 He served in the Royal Engineers from 1915, was severely wounded at Arras and finally discharged in 1918 a week after the Armistice was signed. In 1921 he was invited to return to Port Glasgow to unveil a memorial to twenty-nine friends who fell in that Great War. He was very proud of the gold medallion presented to him during the ceremony. This is the main write-up of the event. There are links at the foot of this page to other newspaper articles. 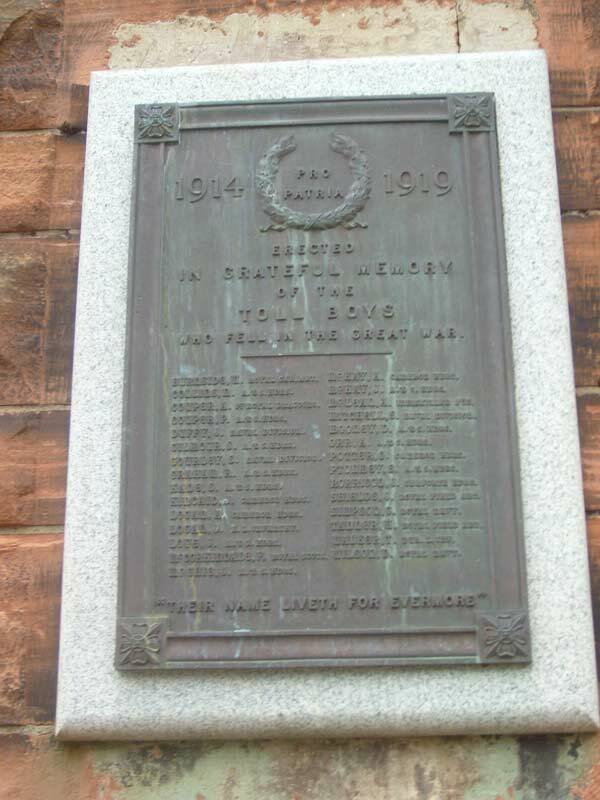 The memorial was attached to No.5 Glasgow Road, a new red sandstone tenement at the corner of Glasgow Road and Caledonia Street. Due to major changes in Port Glasgow over the years, including the realignment of Glasgow Road, this building is now known as No.5 Robert Street. The memorial takes the form of a bronze tablet surrounded by grey granite, and is the work of Mr Archd. Hamilton, Glasgow. It had been placed on the wall of the building at 5 Glasgow Road immediately adjoining Caledonia Street, and where the Old Toll House formerly stood. The memorial has been erected at a cost of close on £70, this amount having been collected through the instrumentality of Mr and Mrs S. McKay, who initiated the proposal to erect the memorial. They have been untiring in their efforts, as have all the members of the committee, and the result of their labour of love may be seen by all who pass by. The memorial bears the names of the twenty-nine lads who fell in the war, and has the following inscription: "Erected in grateful memory of the Toll Boys who fell in the great war; their memory liveth for evermore." The present Toll Boys placed a wreath of purple and white heather at the foot of the memorial, and a wreath of variegated flowers was also placed beside the memorial by one of the relatives of the boys who had fallen. It was fitting that all those who took part in the ceremony on Saturday should have been on active service, and during the service Mr John Lewis, who had lost both legs at Ypres, and who performed the unveiling ceremony, completely broke down. It was. too much for him when the pipers of the Port and District Pipe Band played The Flowers o' the Forest. The day before this ex-soldier lost his legs was the last time he had heard the pipers play that tune, and it was over the burying place of his chum near Ypres. Little wonder the event of Saturday recalled such painful memories. Messrs W. Burnside, R.G.A. ; N. Collins, P. Cooper, S. Gilmour, R. Graham, S. Kane, J. Love, J. McGhie, J. McKay, D. Mooney, A. Orr, S. Ptolomey, Argyll and Sutherland Highlanders; J. Kincaid, A. Logan, A. McKay, G. Potter, Cameron Highlanders; J. Rorison, Seaforth Highlanders; F. McCorkindale, Royal Scots; A. Cooper, Royal. Scots Greys; J. Logan, H.L.I. ; R. McLean, Inniskilling Fusiliers; J. Duffy, S. Mitchell, S. Gourlay, Naval Division; C. Simpson, D. Wilson, Royal Navy; J. Shields, Royal Field Artillery; T. Walker, Durham Light Infantry; W. Tanner, Howitzer Brigade. A small platform was erected in front of the tenement, and on it were the company to take part in the ceremony, including Rev. Herbert Reid, M.C. ; Messrs William Ramsay (who presided), Samuel Mackay, Robert Barr, and John Lewis. Mr Ramsay, in the course of a few opening remarks, said that on such a solemn occasion it was natural that their sympathies should go out to the relatives and friends of the dead heroes. Through their sorrow there was the feeling of pride in the comrades, and gratitude for what they did. That pride was all the greater when it was remembered that these twenty-nine heroes were Old Toll Boys. These gallant men had not been found wanting; they obeyed the call in 1914, and acquitted themselves like men. It was only natural that the Old Toll boys at home should desire to place on record for the inspection of all time the names of the heroes. Many of the old boys went into the great adventure willingly, not knowing that great suffering, even death, was before them. If the deeds of these brave men helped to make it impossible for great nations to war against each other, then their sacrifice would not be in vain; Already was there established a League of Nations, which was a step in the right direction. If they made "Trust" the watchword of all nations people might then look for the dawning of the day about which the national bard wrote - that man to man the world o'er would brothers be for all that. The Old Toll Boys at home had during the war collected £66 10s. Of that 28s went to thirty-eight men serving, the same to a nurse and a W.A.A.C., and a similar amount lodged in the bank for three prisoners of war. Rev. Herbert. Reid, who had been on active service for a number of years in France and Belgium, performed the service of dedication. His prayer was highly impressive, and he paid a glowing tribute to the young men who had gone out from that district. Trumpeter Harkness, of the Royal Garrison Artillery, sounded the "Last Post," and Port-Glasgow and District Pipe Band played "The Flowers o' the Forest." Bailie Cochran on behalf of the committee, presented Mr Lewis with a gold medal as a memento of the occasion. He referred briefly to the patriotism and gallantry displayed by the men from the Toll district and from the entire country during the dark days of the war, and hoped they would be spared a recurrence of such horrors. He had not the least doubt, however, if the occasion ever did arise, the boys from the Toll District would buckle on their armour as those whose memory they were perpetuating that day. Mr Lewis in a few words thanked Bailie Cochran and the committee for the presentation of the medal, and after singing the national anthem the large numbers present dispersed. There were many people visiting the memorial on Saturday evening and Sunday. The Committee wishes to thank the members of the Band, Buglers and Mr Lithgow for permission in granting position for Memorial, and all who helped in any way to make Saturday’s Service so successful. S. McKay & R Barr, Conveners. The picture of the unveiling of the Toll Boys’ Memorial on Saturday will be shown in the Eclipse tonight and during the remainder of the week. Digital photographs © Mary and Murdo Young. Please contact me (Mary Young) with your comments and amendments, I'd love to hear from you.